When I see such an egregious demonstration of how nurses are marginalized and ignored, my (nurse's) blood boils and the hair on my neck stands on end. In the case of cancer treatment, we know that there are nurses who dedicate their lives to cancer, serving as Nurse Practitioners and Clinical Nurse Specialists focused on the practice of oncology; there are also nurse breast cancer experts, nurse researchers, and nurse cancer navigators. The vast majority of chemotherapy is administered by nurses, yet Ken Burns leads the viewing public to believe that nurses have little whatsoever to do with the treatment of cancer. Meanwhile, there are also occupational therapists, physical therapists, speech language pathologists, and countless other professionals who contribute to the fight against cancer and the treatment of those living with it. On Digital Doorway and RNFM Radio, we've featured filmmakers who have gone out of their way to use filmmaking as a means to highlight and celebrate the achievements of nurses and the nursing profession. 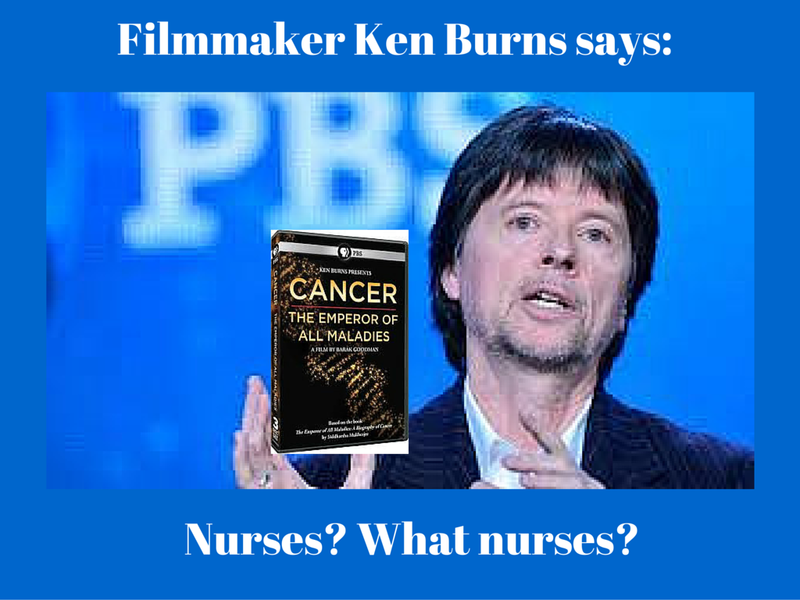 With nurses being the largest percentage of healthcare workers and the most trusted professionals in the United States, ignorant individuals like Ken Burns perpetuate a lack of understanding of what nurses do and how important we are to the health and well-being of millions. Nurses and non-nurses alike can speak up, speak out, rail against such marginalization, and loudly call out those who fail to highlight nurses when it would be wholly appropriate to do so. If Mr. Burns had spent even fifteen minutes discussing the contributions of nurses to cancer care, this would have been a satisfactory nod in our direction. Sadly, in his overwhelming desire to elevate the doctors and scientists as much as possible, nurses were given worse than short shrift; we were given nothing. As much as there was understandable outrage when the folks on "The View" laughed at Ms. Colorado and asked why she was wearing "a doctor's stethoscope," there are even more maddening ways in which nurses are marginalized, forgotten, swept aside, or ignored; it happens every day, folks. How will you speak out about nursing today? And tomorrow? Who will you educate? Who will you set straight? If we all hear the call and trumpet the accomplishments and skill of nurses across the land, perhaps more people will sit up and pay attention; even Ken Burns.